I had the great pleasure of meeting Michael Recchiuti a few years ago at the New York Chocolate Show where I sampled some of his incredible works of art (chocolate!) and got the inside dish about chocolate making (read his book Chocolate Obsession because it's that good). For a good while now I've been wanting to blog about Recchiuti Confections because Michael had to be one of the most passionate people I have ever met. That passion comes through his work in the form of Synesthesia inducing confections. Try his Spring Jasmine Tea, Lemon Verbena and Lavender Vanilla to find out what I mean (hint: you'll be eating perfume and loving it). The reason I'm writing about Recchiuti right now is because they have come out with a very special project that blends fine art with chocolate and a really good cause. A mighty sweet Give Twice moment in the making. When you purchase a gift box of Creativity Explored I &/or Creativity Explored ll, $21., $2 from each sale goes directly to Creativity Explored. Creativity Explored is a San Francisco visual arts center that showcases artists with developmental disabilities. 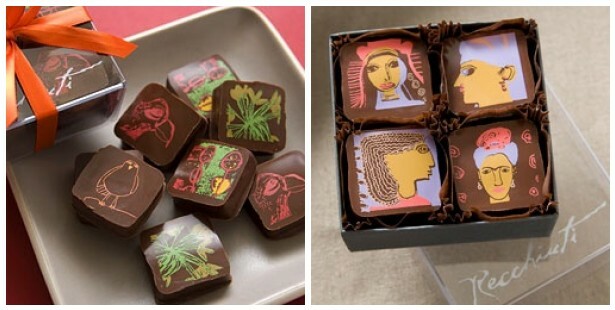 Artists from the center partnered with Recchiuti to create the lovely chocolate designs above. Eating lovely art sounds delicious to me! Added: the Creativity Explored III is now out, find it here featuring art work by artist Vincent Jackson. I & II now seem sold out. Grab this one while you can.